Attention Middle and High School Folks! Looking for something to do on your MLK Day off? Like helping others? Eating Snacks? Hanging with fun people? 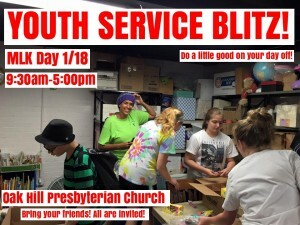 Then join us for our very first Youth Service Blitz! We’ll be sure to feed you a delicious lunch in the middle of the day, and we’ll close out all that good effort with some Human Foosball fun at Great American Human Foosball! All are welcome. Bring a friend or a classmate. Please RSVP to erin.counihan@oakhillpcusa.org so we know exactly how much delicious lunch to plan for, and for permission forms and logistical things, too.